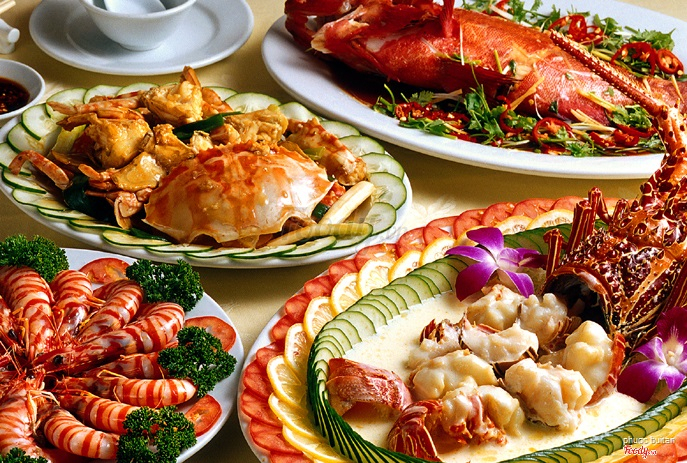 Why Bau Troi Do Seafood Restaurant is special ? The restaurant is located on the beach road with dozens of other restaurants nearby but it is still one worth seeking out. The 2 dishes which stand out are the Sashimi Clams, a fusion dish combining Japanese and Vietnamese cooking styles, and the Steamed Squid with lemon leaves and lemongrass in a clay pot. The chef as well as the owner, Mr. Cong, has extensive experience working in th kitchens for 5 star resorts such as The Furama and The Nam Hai. The brings this experience and attention to detail to Bau Troi Do. His aim is to provide a restaurant with good hygiene, good food, reasonable prices, good service, good ingredients and a great seaside location. How to get to Bau Troi Do Seafood Restaurant? The best way is to use taxi to get to Bau Troi Do Restaurant. If you are in the Pham Van Dong area, you can walk to this restaurant. The waiter is not really good at English. You can pick out the fresh seafood from the hold tank for dinner. This place was exactly what my family and I were looking for in Danang - a simple, local restaurant serving fresh food at great value. We had steamed lobster, grilled grouper, steamed clams, tamarind crabs, spinach, eggplants, BBQ baby fish, grilled oysters and rice, for half of what it would cost us in Singapore. Great overall experience for seafood - ordering was a breeze as a young waitress serving us spoke English, dined alfresco, sitting on low chairs and among locals. Highly recommended! We'd certainly come back the next time we visit Danang. My wife and I visited the restaurant after reading review of fellow travellers of TA. It is just located on the main street nearby the sea, about 15 minutes drive away from the Fusion Maia Resort where we stayed. When we arrived, we were told to select our seafood from the plastic tanks with air pump, which was used to keep the seafood fresh, I guess. We have eventually chosen clams, scallops, oysters, squids, crabs and prawns from the tanks. Chef Cong (the owner) proactively recommended different cooking ways in local style. Clams – Cooked in soup Scallops- Steamed Oysters – some raw (we requested but grilled were more tasty)and some charcoal grilled Squids – cooked in a clay pot with herbs Crabs- fried with tamarind Prawns- grilled Apart from the seafood, we also ordered banana flower salad, grilled eggplant and seafood fried rice. Cannot imagine how 2 people could eat such a lot of food! All of the food was so delicious and we could not stop ourselves to order 2nd round and 3rd round…We were especially impressed by the clams and scallops that were so fresh and sweet. The clams were served in a pot with soup (a bit spicy) and I finally drank all. The scallops were steamed with some garlic and herbs. It tasted amazing! The fried rice was also fantastic! The owner who spoke English was so friendly and nice. He particularly enjoyed chatting with Hong Kongers as he stayed in Hong Kong for 4 years in 90’s and then back to Vietnam worked for a 5-star hotel as a chef . A lady staff who served us, spoke some English was so kind as well. Last but not the least, the price was so good, 9 dishes, 5 bottles of beer and 1 soft drink for about USD40!